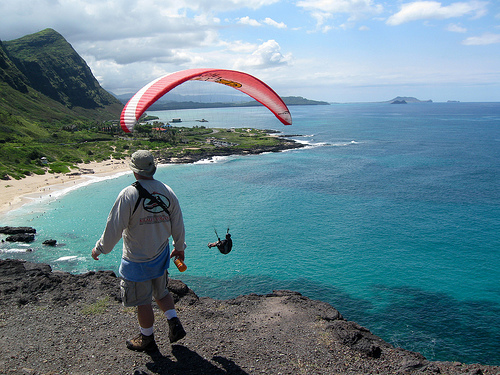 You will see paragliders at Makapuu Beach quite often. It’s a hobby of mine so I will talk about it a lot. If you want to take a tandem ride, click Wind Lines. On the Chatter Box post the question, “Is anyone doing tandems today”? You can either wait and watch for a reply or leave your cell. Makapu’u is just a few minutes from Sandy’s but couldn’t be more different. 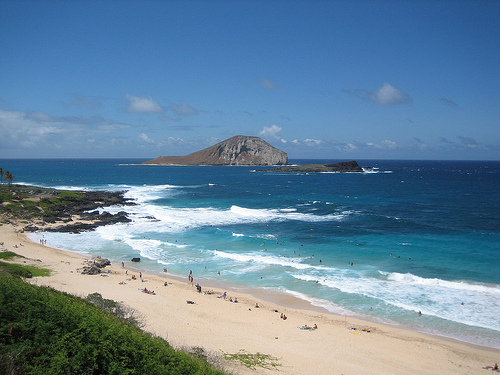 Instead of sand, there is rock, and when Sandy’s is up (big waves), Makapu’u is calm and vice versa. There is great boogie boarding and body surfing but be careful of the strong shore break. The look out to the south of the beach is a great place to see the two offshore islands, Rabbit Island and Black Island and if you are luck you can see humpback whales. 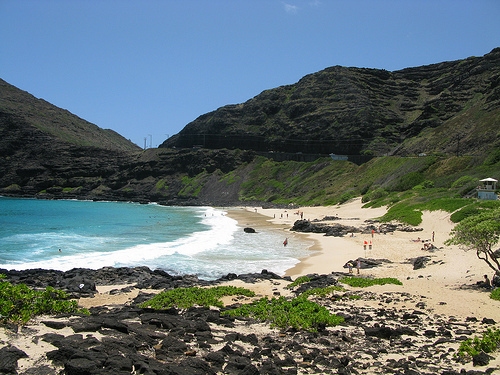 Makapuu Beach OCEAN INFORMATION — For a detailed description of the Pacific Ocean’s marine climate, water properties, currents, tides, waves, etc., please visit The Ocean Atlas of Hawaii online. You’ll learn many interesting facts, like our average surface water temperature in Winter is 75 F (24 C) and 81 F (27 C)in the Summer.Call 596-SURF (that’s 596-7873) to hear a recorded message on conditions at various O`ahu beaches. The recording is a free service of the Surf News Network (SNN) and is updated four times a day, 365 days a year, at 7 a.m., noon, 3 p.m. and 7 p.m. In addition to wave heights, SNN provides information on winds, tides, and buoy readings.